8 voltage settings : 240Vac, 2kV, 6kV, 11kV, 22kV, 33kV, 132kV and 275kV. Use 3 x 15.V "C" batteries. Light weight, robust & compact. Detect low voltage on any systems. 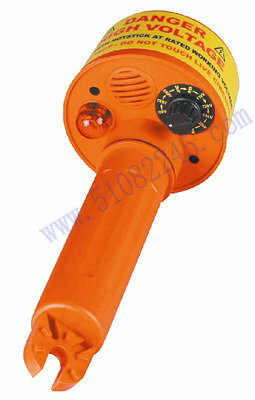 The SEW 275 HP is a high voltage proximity detector. It has eight voltage detection settings from 240Vac to 275Vac. The 275 HP consists of an internal pickup sensor plate, a sensitivity selector, a visual and a sound annunciator. With the 275 HP, physical contact with electrical conductors is not necessary when testing for live lines. This tester works by proximity. Its sensor senses the radiated field which surrounds live conductors. Radiated field strength increases with voltage and decreases quickly with distance or earth shielding. The radiated field from a cable of closely bunched conductors suppplied by three phase power tends to cancel (See "Limitations of use" paragraph). Detecting distance of a 250Vac single live wire is approximately 10cm. With a bunched neutral and earth cable, as in a flexible cable, the distance is reduced to 5cm. When testing for high voltage, the rotary switch (attenuator) is used to identify and differentiate various HV live cables. 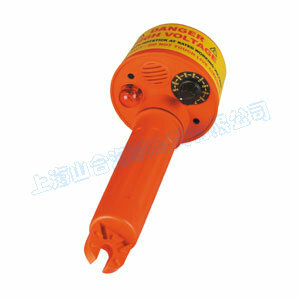 The tester must be used in conjunction with a long and insulating rod when measuring high voltage (kV). However, the 275 HP is a non-contact tester and it is advised that the tester should never come into contact with cables (kV) as this tester is merely a non-contact AC proximity tester. Checking or proofing the tester is easy. Switch the sensitivity to 240V and place the dome against a low voltage live conductor or rub the dome with a cloth or against an item of clothing as this generates a static DC which triggers the detection of circuit. The light and beeper should go "ON" as a wire is live. It is recommended that the 275 HP is not used in HV yards of mixed voltages. In the presence of mixed voltages, the tester can become unreliable. Problems can arise when the tertiary circuit of a 275/133/11kV transformer is tested. The electric field of the HV and MV bus bars can trigger the detector when it is about 3m above the ground. This is common with most of the electric field voltage detectors, and the users should be aware of it. The tester can pick up adjacent circuit to the one being tested and indicate the wrong information to the user.